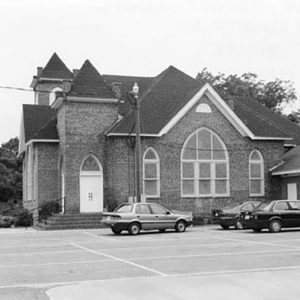 Wade Alston Ford, an African American architect from Lake View, South Carolina, designed and oversaw construction of this Late Gothic Revival church. Five volunteer craftsmen built the cruciform church between 1922 and 1926. This is the second building to house the congregation, which was founded by former slaves or the children of former slaves in 1882 underneath a brush arbor.